On the first page I explained how I got to Kamakura by train, and stayed at the Kamakura Central Guest House. Then on the second page I wandered around Kamakura. 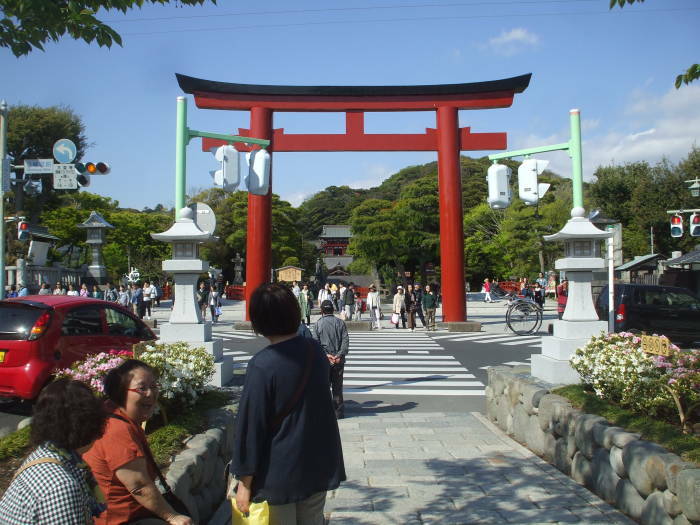 Tsurugaoka Hachiman-gū has been the main feature within the town of Kamakura since the 1100s CE. A broad and dramatic approach leads from the beach to this Shintō shrine built by a powerful Kamakura Shōgun. Shintō holds that the Emperor of Japan is a descendent of the gods. The people didn't give up that belief, they thought it was nice that the Emperor was a deity and all that, but the warlords were much better at simply getting things done. The Emperor was based in Kyōto, and controlled little beyond the Imperial house. The Shōguns led feudal military governments and were the de facto rulers of Japan for most of the period from 1185 to 1868. The Kamakura Shōgunate ruled from 1185 to 1333, starting the long era of shōgun power. Minamoto no Yoritomo seized power from the aristocracy at the end of the Genpei War in 1192, and he and the Minamoto clan established their military government in Kamakura. The Mongols under Kublai Khan tried to invade Japan by sea in 1274 and 1281. In 1274 the Mongol fleet landed and fought for eight hours, suffering heavy losses. Then a storm approached. The Mongols retreated to their ships and put out to sea, and then the typhon destroyed one-third of their fleet. A total of about 150,000 troops, or so the chronicles claimed. Modern historians figure that it was half that at most, more likely about 10% or 15,000. The Mongols returned in 1281 with a force of some 50,000 consisting of Mongol, Korean, and Chinese soldiers, plus some 100,000 conscripts from the recently defeated Song empire in south China. They landed and fought the Japanese forces in several places across Kyūshū. Another typhoon approached, and the Mongol-led forces tried to return to sea to ride out the storm. Thousands of the invading troops were not able to get back to the ships, and they were slaughtered by the samurai. Of those that did make it to sea, the typhoon destroyed at least one-third of the ships carrying the Mongol-Korea-China forces, and perhaps half of those carrying the Song conscripts. That was the end of Mongol attempts to capture Japan. The Kamikaze or "Divine Wind" became Japanese military legend. Meanwhile, Kamakura had grown to a population of about 200,000, more than today's 170,000 or so. 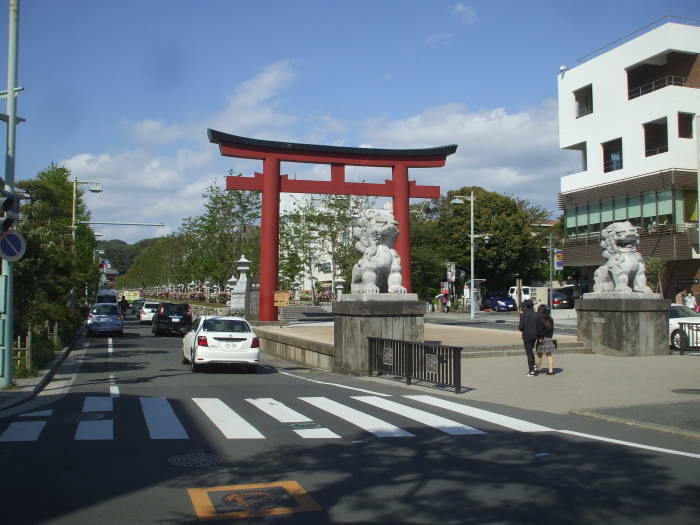 That made Kamakura the largest city in Japan and 4th largest world-wide. In 1331 the Emperor Go-Daigo took on the Shōgun, but was defeated and exiled to Oki Island. A warlord went to rescue the Emperor. The Kamakura Shōgunate sent a force to attack the Emperor's base in Kyōto, and then the leader of that force decided to switch sides and support the Emperor. While all that was going on, Nitta Yoshisada, a warlord supporting the Emperor, attacked Kamakura. The legend of the Siege of Kamakura is a mix of King Arthur and Moses, plus maybe a little of The Godfather. Yoshisada, head of the Nitta clan, marched on Kamakura. The city is almost completely surrounded by a ring of hills and ridges. This natural defensive ring, which runs all the way around Kamakura and down to the shoreline on either side of the beach, is only about 150 to 200 meters high. But, it's rugged enough to make it very difficult to cross when it's defended. After failing to make his way through any of the Seven Entrances of Kamakura, the defended passes, the legend says that Yoshisada marched his men to the Inamuragasaki Cape on the west side of Kamakura's opening into Sagami Bay and thus the Pacific Ocean. Yoshisada then threw his sword into the sea and prayed to Ryūjin, the god of the sea. Ryūjin's daughter was the beautiful goddess Otohime, and her son was Emperor Jimmu, the First Emperor of Japan. The Taiheiki says that the ur-goddess of Japan, the Sun Goddess and the sister of Susano-o the Storm God, Amaterasu Ōmikami herself, manifested as Ryūjin. So, Yoshisada was actually talking to the Top Boss, and she also was an ancestor of Emperor Jimmu. Seeing that this was Family Business, Amaterasu-as-Ryūjin withdrew the sea and cleared the way for Yoshisada's forces to march around the point and attack Kamakura. 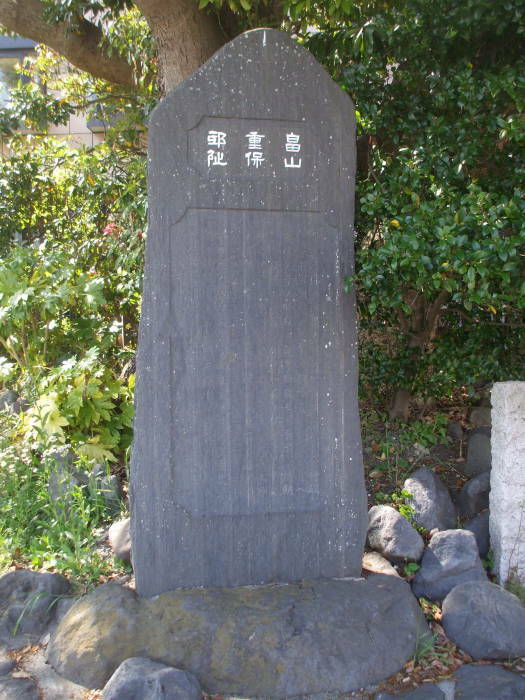 A stele at Sode no Ura, a small bay just west of Inamuragaki, commemorates the events today. Meanwhile, historians point out that on 5 July 1333 CE, the date of the battle by today's Gregorian calendar, the tide was unusually low. The Shōgunate forces retreated to the Tōshō-ji family temple. About 900 samurai, including the three most recent Regents wielding the real power, performed seppuku. That's the ritual suicide by disembowelment. Yoshisada's forces were sacking the city. Now about 6,000 residents followed the samurai example and performed seppuku. 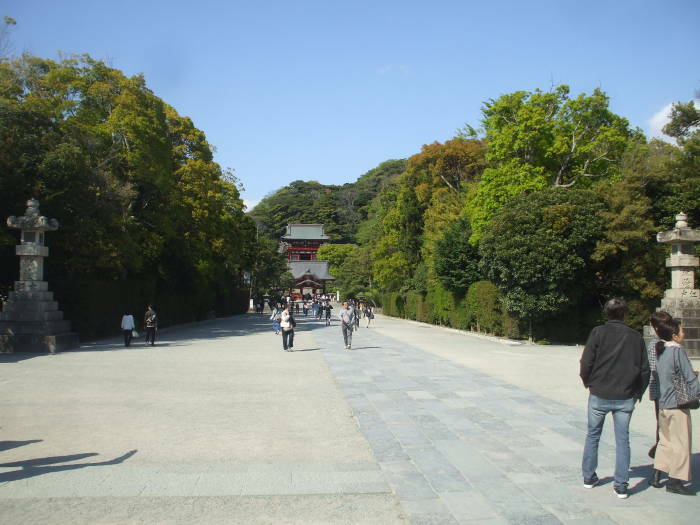 So, there were about 6,900 ritual suicides in Kamakura on one day. So, what can we see today? Wakamiya Ōji is the sandō or "visiting path" leading from a landing point on the beach to the Tsurugaoka Hachiman-gū shrine. 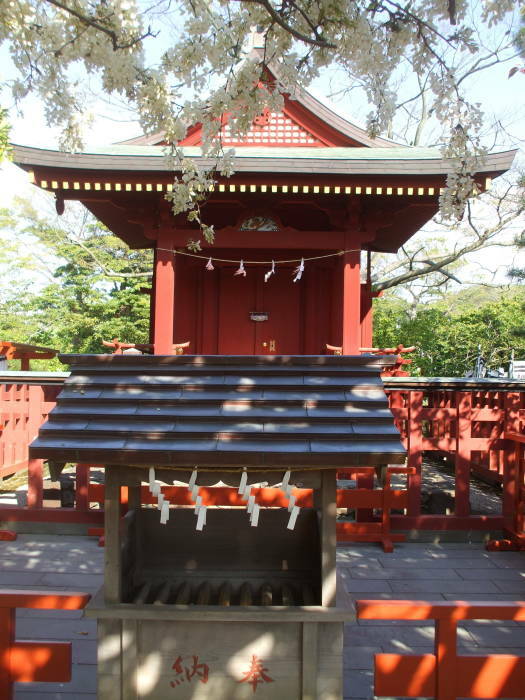 During the Kamakura Shōgunate it was a sacred space, off-limits to the common people and used only for ritualized visits to the shrine. Today it's the main street through town. It starts at the beach and runs past the fire station, the Kamakura Central Guest House where I stayed, the hospital, a good yakitori stand, and the train station. Ichi no Torii or the First Gate marks the first passage from the everyday world into sacred space. The Great Kantō Earthquake of 1923 seriously damaged all but the bottom sections of the vertical pillars. The current version was rebuilt in steel-reinforced concrete in 1934. 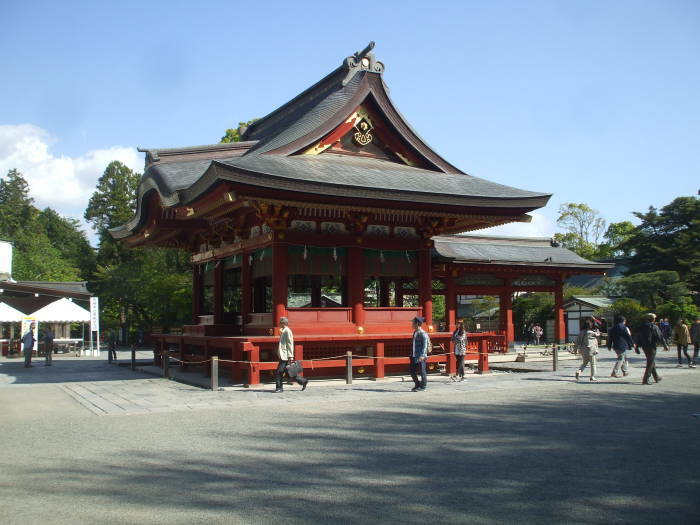 See an earlier page for a discussion of how Buddhist temples and Shintō shrines embody the transcience of existence. 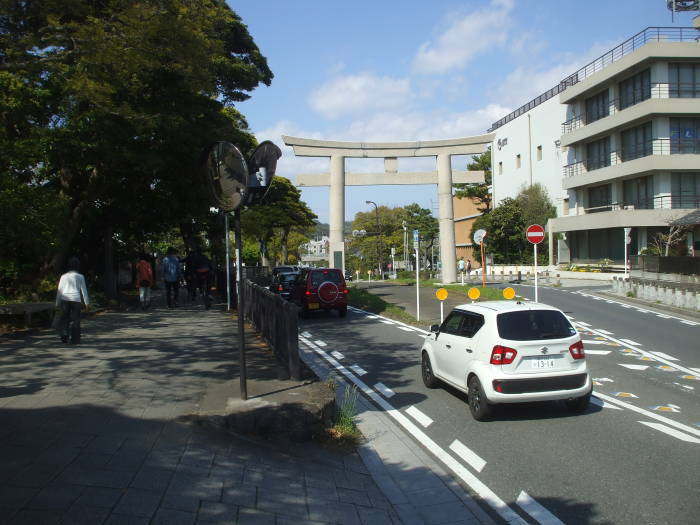 The original street was 33 meters wide, flanked on both sides by a 3-meter-deep canal and evergreen trees (which today are only found at Ichi no Torii). Hatakeyama Rokurō Shigeyasu was a samurai who was killed in political intrigue in 1205 CE. The grave under a tree next to Ichi no Torii is believed to be his. 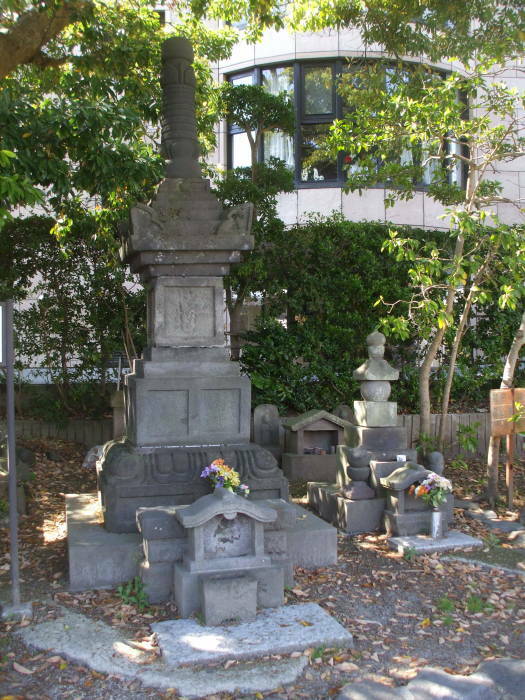 The hōkyōintō or stone pagoda is a prominent example of that type of grave marker. My page about the large Buddhist cemetery of Okunoin at Kōya-san explains the symbolism of Buddhist grave markers. A nearby stele was erected in 1920. Only indirectly related to the grave, it explains the intrigue surrounding Shigeyasu's death. It doesn't mention the asthma that Shigeyasu suffered from. He was suffering from an asthma attack when he was killed in combat in 1205 CE. 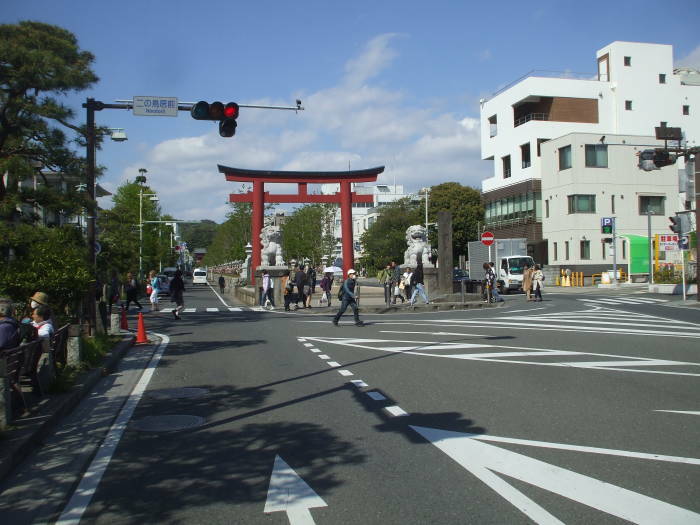 Ni no Torii is the Second Gate. We pass into more sacred space, and things become more elaborate. 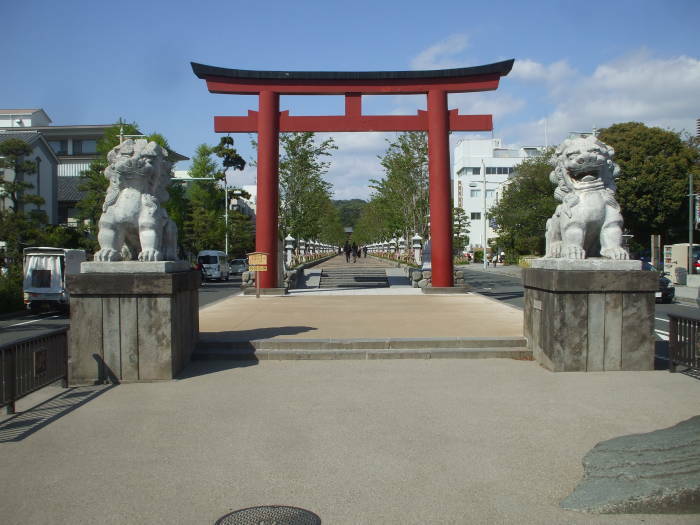 The dankazura, a raised pathway lined with cherry trees, leads on from the second to the third torii. We can see part of the temple complex in the distance. Look at these guardian lion-dogs. You almost always find that one of a pair of protector figures has an open mouth, pronouncing the sound of the Sanskrit letter अ or A, while the other protector has a closed mouth, pronouncing the sound of the Sanskrit latter म or MA. Together they pronounce the sacred syllable Aum or ॐ.
Aum is the sacred sound of Hinduism, but it is used as a mantra in Buddhist, Jain, and Sikh practice. Here we're headed into a Shintō shrine complex. But it also contains a Tendai-shū Buddhist temple (that is, Mahayana or Lotus Sutra school Buddhism). Religion in Japan is dizzingly syncretic. We're at the north end of dankazura, about to pass through San no Torii. San no Torii is the Third Gate. Three torii, three passages into increasingly sacred space along Wakamiya Ōji, the formal processional path from the beach to the shrine. Now we enter the precincts of Tsurugaoka Hachiman-gū. 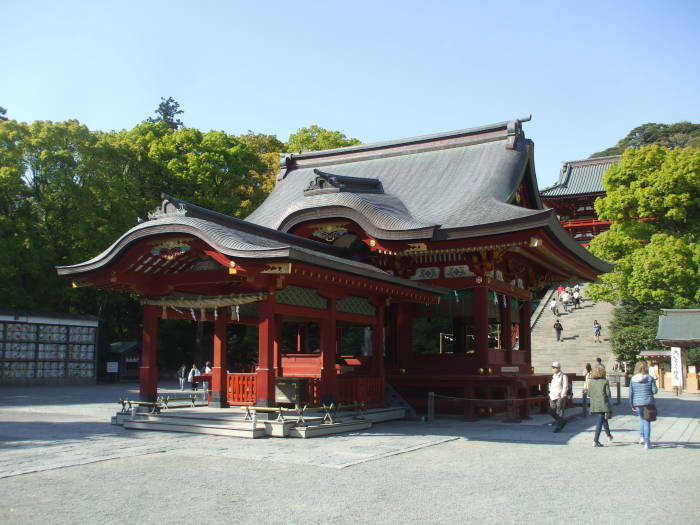 Shintō shrines are said to enshrine a kami, a spirit for whom the word "god" in the western sense doesn't fit at all. 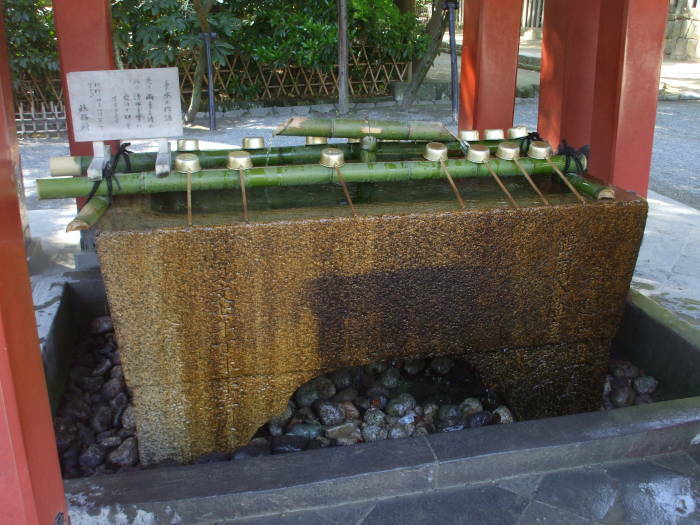 Usually the kami has to do with local nature, and it might be so vague as to be the spirit of a view of a waterfall, or of the sound of a stream. But Hachiman is very different. Hachiman is the syncretic divinity of archery and war, combining elements from both Shintō and Buddhism. Actually "God of War" is an oversimplification, it's more that he's the god of warriors. Hachiman is also the divine protector of Japan, the Imperial House, and the Japanese people. Belief in a form of Hachiman existed in prehistoric Japan. Once Buddhism arrived via Korea from China in 552 CE, the concept of Hachiman combined elements of the earlier kami worship with Buddhism. Shinbutsu-shūgō is the term for the idea that a Shintō kami could manifest as a Buddhist bodhisattva (or bosatsu in Japanese). In the 700s CE Hachiman became Hachiman Great Bodhisattva, or Hachiman Daibosatsu. Emperor Ōjin was an ancestor of the Minamoto clan. Through him, Hachiman became the guardian kami of the Minamoto samurai clan. Minamoto no Yoritomo became Shōgun and established the Kamakura Shōgunate. With that, Hachiman became the guardian deity of the Shōgunate and thus the country. Hachiman was the god of warriors, so of course the samurai worshiped him. But he also became popular with the peasants. Now Hachiman is the second-most popular kami in Shintō, second only to the somewhat vague or at least multiply-formed and general-purpose Inari Ōkami. Inari Ōkami, basically "Inari Most-Holy-Kami", is the kami of foxes, of fertility, of rice, of tea and sake, of agriculture and industry, and of general prosperity and worldly success. Inari may be represented as male, or female, or androgynous, and may be represented as a collective of three or five individual kami. Inari Ōkami is a deity that's a little of everything and associated with many things and locations. 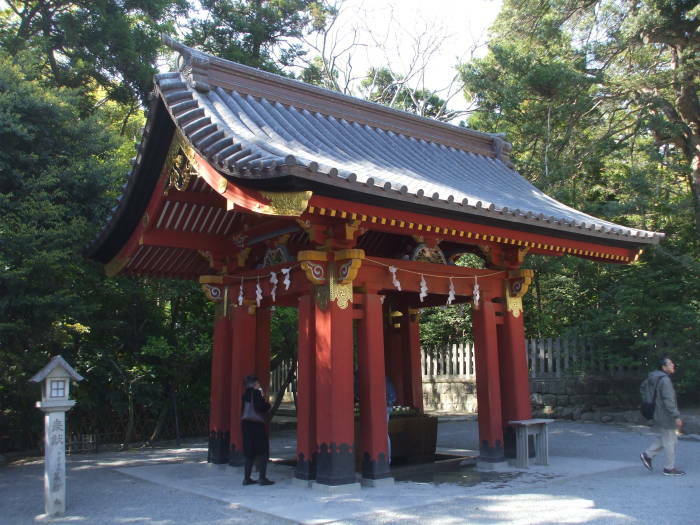 But this is Hachiman-gu, a shrine to Hachiman, an unusually specific kami as Shintō goes. The Maiden pavilion is at the base of the stairs. Weddings, dances, and music often happen here. 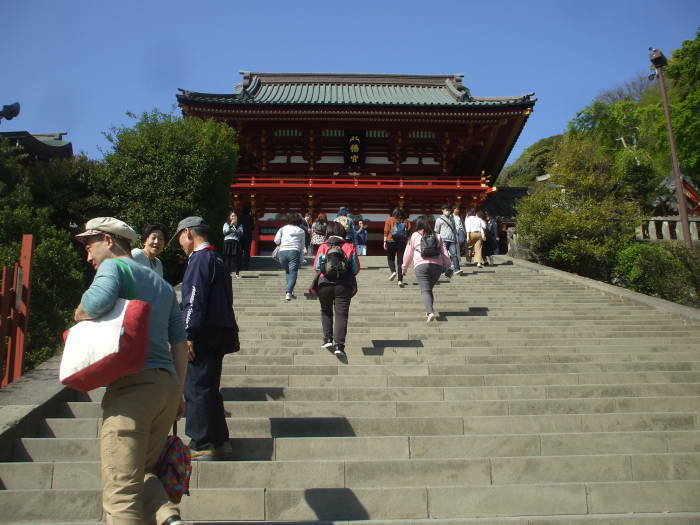 The main shrine, the Senior Shrine or Hongū lies ahead, up a steep staircase. 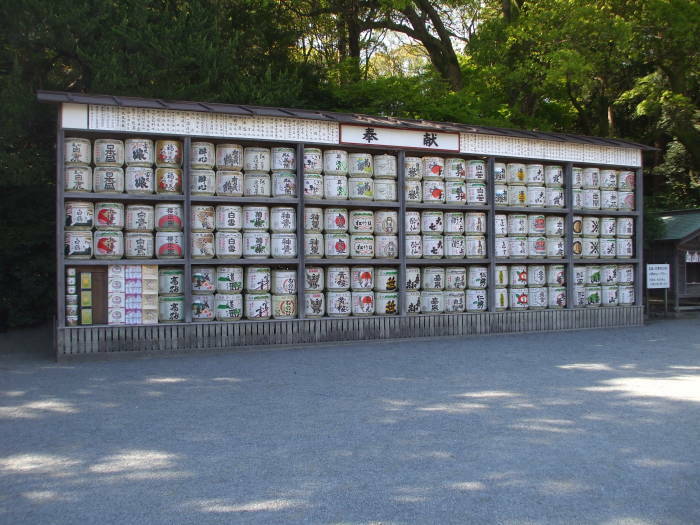 On the way we pass a collection of sake barrels donated by the various breweries. The stairs are steep! I found that Japanese staircase pitches are very steep, and the steps are very small. It's hard to go down, as your heel comes down into the riser of the step above. Well, I have big feet. But I saw local people having difficulty. Some turned and side-stepped down, the same as I did on some especially steep and narrow stairs. You can look out from the Senior Shrine over the surrounding complex and the series of torii out toward the beach. The shrine complex and the surrounding city were laid out according to Feng Shui concepts. A diviner had selected its location as the most propitious because there was a mountain to the north, a river to the east, a great road to the west, and it was open to the south toward Sagami Bay. Specific deities guarded the directions: Genbu to the north, Seiryū to the east, Byakko to the west, and Suzaku to the south. 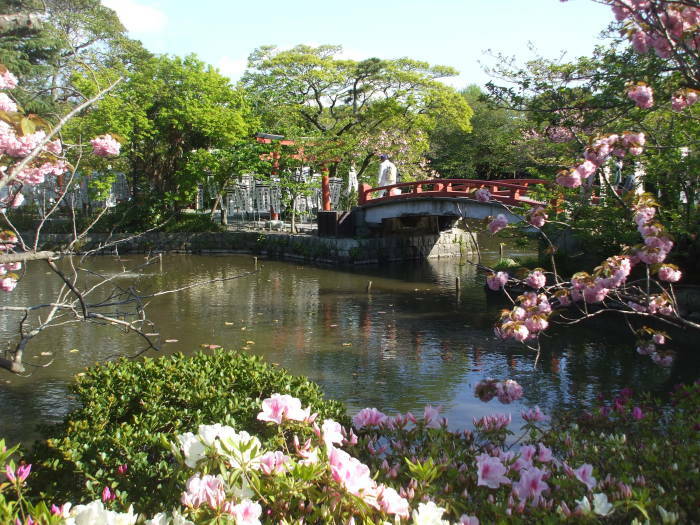 Ponds and orchards within the complex are surrounded by small shrines. 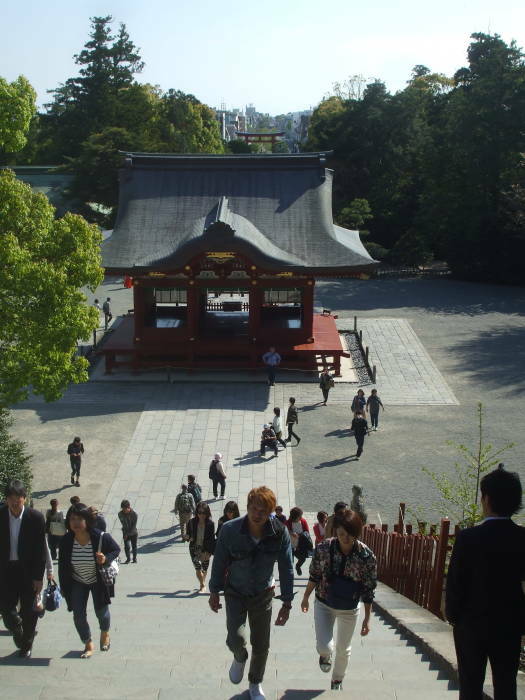 The next pages take us through the temples north of Kamakura, starting with Tōkei-ji.